Word Walls • Interactive Word Wall...BRIGHT IDEA! Home CURRICULUMAssessmentInteractive Word Wall…BRIGHT IDEA! I have another easy-peasy BRIGHT IDEA for you today. I had had a love-hate relationship with word walls for a very long time. I’ve always believed they were important, but faced a few word wall obstacles that made them a bit tough. But after years of trials and changes – I have a system that works and I LOVE it! 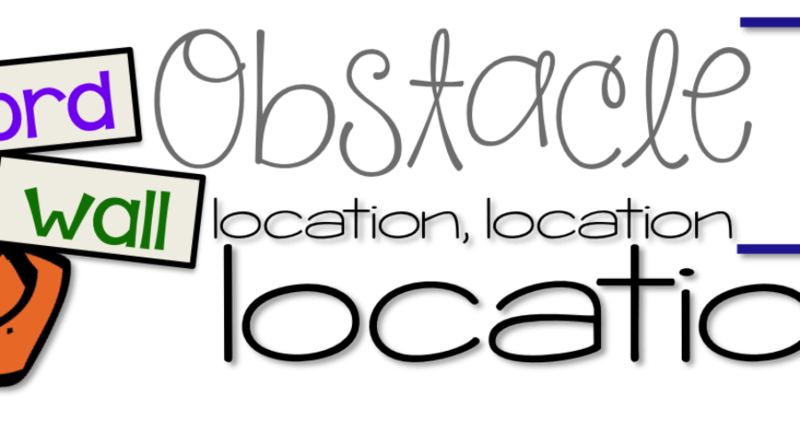 Here’s a run down on how I side-step those obstacles. I have found the best way to get things to stick to these types of surfaces is blue Fun-Tak tacky putty! It sticks great AND allows things to be easily moved and removed. I find it at Target. The “1” on the backs of the cards indicates they are words from the first trimester. This helps me when I take them down to store them for the following year. Keeping ALL of the words we discuss/learn/assign (be it sight, high-frequency, or vocabulary) on the word wall all year lessens it’s effectiveness. We have a little spelling “test”. I let the kiddos know that this is just for me and I won’t be grading it. I have them number a paper that I have folded to make numbering with adequate space between columns easy for them. Then I ask them to spell the words I’ve taken off the wall. “Checking in” periodically and removing words off the wall helps keep the chaos off the space and makes it easier for the kiddos to find the words they need. Each morning we practice our words. One of the students has the job of “pointer“. That kiddo grabs the pointer from the cabinet, then points to the words as the rest of the class reads them. It’s the pointer’s job to go VERY fast and it’s the kiddos job to keep up. They love the race. A child’s stick is selected from the “blank” cup. If they read the words with no more than 2 errors, their stick is moved to the “Passed” cup. If not, it just goes back so they have an opportunity to be chosen again. This is a quick way for me to assess who has it and who doesn’t. The kiddos also LOVE to “read the wall” during independent word work. They are permitted to take turns pointing to the words. The only rule is that they must not use the name sticks during this time. Each week I expose my kids to 9 more words to learn. Some are strictly sight words (can’t be sounded out, don’t follow the rules) and others are high-frequency words (introduced in order of frequency and often phonetic in nature). These words are part of their homework, and 4 of them are also part of their weekly spelling. We practice these words in our core curriculum during the same time as well as our Morning Wake-Up and Daily Literacy Practice – basically everything that is part of our daily routine. After that week of introduction, the words are added to the word wall. The kids remember having learned them, so when they are searching for how to spell them, the wall serves as a perfect spelling dictionary. So there you have it – a useful, forever changing word wall. Like I said, easy-peasy! I hopped over during the Bright Ideas Blog Hop! This year I love/hate my word wall. Thanks for some ideas to make it better! Great ideas for making a word wall interactive! I so agree with you that if the word wall isn't being used and interacted with it will not be as effective as it could be. Such great ideas! I love the cups! Need to try those soon! Thanks for sharing! Love the idea of having them read the words to the class! Pinned!! Thanks! I draw sticks from cups and we go through a timed ppt, BUT I love your idea of two cups!!! Totally going to do that!! 🙂 Thanks so much for sharing! Love this! Want to get this going! Do you have the words for sale in your TPT or have a available? Great ideas Traci. I like the morning race and the test. I am already a HUGE fan!!!! I love all your ideas and I'm truly loving these Sitspots!!!!! As I told the others….I'm going to get them either way =) Thanks for sharing ALL that you do!!!! This is full of great information! Thank you!